Configure Tableau Desktop license usage reporting to gather usage information from individual instances of Tableau Desktop and send the information to an instance of Tableau Server that you designate. You can use the information that's gathered to help you manage the Tableau Desktop licenses in your organization. For information about how to track Server Licenses usage, see View Server Licenses in the Server online help. 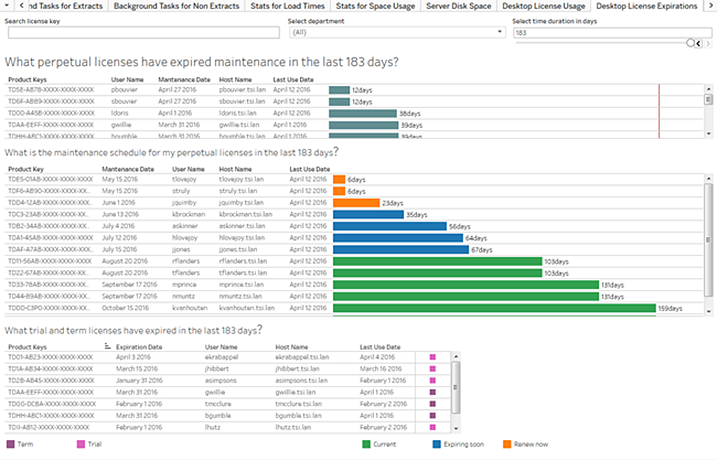 Tableau provides the following tools to help you track and manage licensing and usage in your organization. The Customer Portal page on the Tableau website lets you purchase, manage, and view registration information for product keys that are assigned to your users. You can manage your Tableau account on behalf of your organization, download Tableau Desktop installation packages and open and manage current and prior case interactions with Tableau's technical support team. The portal doesn't provide detailed usage data. However, you can determine who has installed Tableau installations in your organization according to the user registration records that are available in the portal. For Tableau Desktop (version 10.0 and later), you can configure it to report usage information to an instance of Tableau Server that's running in your organization. Tableau Desktop reporting gathers usage information from individual instances of Tableau Desktop and sends the information to Tableau Server, where you can use administrative views to track and report on usage. By configuring Tableau Desktop to report usage information, you can also validate that the product key-registration pairs that are shown in the portal match the activated Tableau Desktop-user pairs in your organization. For more information, see Manage Tableau Desktop License Usage . For information about how to track Server Licenses usage, see View Server Licenses in the Server online help. You can configure Tableau Desktop (version 10.4 and later) to automatically deactivate a license after a predetermined period of time. This is especially useful for organizations that use non-persistent virtual desktops that might be recycled without deactivating an installed Tableau Desktop license. When you configure your Tableau Desktop instances for automatic license deactivation, if a VM is recycled or a computer reimaged, any activated license on that VM or computer will be automatically deactivated after a preset period of time, giving you the option to activate it on a different computer. Enable reporting on Tableau Server. Configure Tableau Desktop installations to report to one or more instances of Tableau Server. A Tableau Server TSM administrator can enable reporting using the TSM web interface, or from a command line, using the TSM CLI. You only need to do this using one of the procedures listed below. https://<tsm-computer-name>:8850. For more information, see Sign in to Tableau Services Manager Web UI in the Server help. Click Notifications on the Configuration tab, and then click Events. Under Server health monitoring, select the Send emails for Tableau Server license reporting checkbox. For more information about how to use tsm, see tsm Command Line Reference in the Tableau Server Help. For Tableau installations on Windows computers, you can use installer command properties to specify an instance of Tableau Server to report to and set a different reporting frequency interval. The REPORTINGSERVER property defines one or more instances of Tableau Server where license reporting information is sent. To specify an instance of Tableau Server, use the URL that you would normally use to connect to the server, including the port, if it is not the default of port 80. If Tableau Server uses SSL you need to preface the URL with https://, otherwise use http://. The SCHEDULEREPORTINTERVAL property sets the interval in seconds that Tableau will use for reporting to the server or servers. The following command installs Tableau Desktop and configures it to report to two Tableau Server instances at a reporting interval of two hours. tableau-setup-std-x64.exe /quiet ACCEPTEULA=1 SCHEDULEREPORTINTERVAL=7200 REPORTINGSERVER="https://mytableau02:8010,http://mytableau"
For more information about using command line properties, see Install Tableau Desktop and Tableau Prep Builder from the Command Line. Add a Windows registry key (ReportingServer) or a Mac .plist file value (com.tableau.ReportingServer.plist) with the address of one or more Tableau Server instances where you want to send the license information. You can configure the Tableau Desktop instance to send reporting information to up to six different servers. You can also edit the registry or .plist file to specify a non-default reporting frequency interval. For more information, see Enable Tableau Desktop reporting after installation in this topic. If you update the registry or .plist file after Tableau Desktop is installed, you need to restart Tableau Desktop for the changes to take effect. If your organization has already deployed Tableau Desktop and wants to use Desktop reporting, you must update the registry key or .plist file value on each computer where Tableau Desktop is installed. As an administrator on the computer running Tableau Desktop, make a backup of the registry file before you make any changes to it. Name: Add a string value named Server. Data: Add the URL or URLs of the Tableau Server instances that the Tableau Desktop instance will send reporting data to. Include the protocol (http or https) and the port number if needed. Separate multiple addresses with a comma (,). You can include up to six addresses. Any addresses after the sixth one are ignored. For example, the following Server value configures Tableau Desktop to report to two Tableau Server instances. The first, https://mytableau02, is configured for SSL and listens on port 8010. The second, http://mytableau, doesn't use SSL and listens on the default port, 80. Name: Add a string value named ScheduleReportInterval. Data: Add the interval, in seconds, at which you want Tableau Desktop to report to the server. For example, a ScheduleReportInterval value of 14400 configures Tableau Desktop to report every four hours. The illustration below shows what the Server and ScheduleReportInterval keys looks like in the registry editor. Restart Tableau so the changes take effect. Make a backup of the .plist file before you make any changes to it. Create a com.tableau.ReportingServer.plist file in /Library/Preferences with a Server key set to the address of the server you want the Tableau Desktop instance to report to, and a scheduleReportInterval key set to the frequency in seconds that Tableau Desktop should report to the servers. A .plist file that's configured to send information every four hours to two servers, https://mytableau02:8010 and http://mytableau. Open a Terminal prompt as an Administrator and use the following commands to set the address of the server you want the Tableau Desktop instance to report to, and a scheduleReportInterval -string to set the frequency in seconds that Tableau Desktop should report to the servers. sudo defaults write /Library/Preferences/com.tableau.ReportingServer Server -string https://mytableau02:8010,http://mytableau"
sudo defaults write /Library/Preferences/com.tableau.ReportingServer scheduleReportInterval -string "14400"
Important: Do not copy and paste the above examples into the Terminal. Type them in manually to avoid getting an error. After you've configured instances of Tableau Desktop for reporting, it sends usage information to Tableau Server. If you've enabled reporting on Tableau Server, you can use the Tableau Desktop License Usage administrative view see license usage data. What types of licenses are installed in your organization. Which users have Tableau licenses. Which licenses are used most often and least often. Whether trial licenses need to be converted to paid licenses. Which licenses are expired or might soon expire. When maintenance renewals are due in your organization. You can also use the administrative view to identify heavy usage, and you can determine whether specific users have not been using Tableau and might need additional training. For more information, see Desktop License Usage and Desktop License Expiration in the Tableau Server Help.